Noah Frick-Alofs / Daily Senior Staffer A group of cyclists ride down Ridge Avenue during the 2018 Bike the Ridge event. 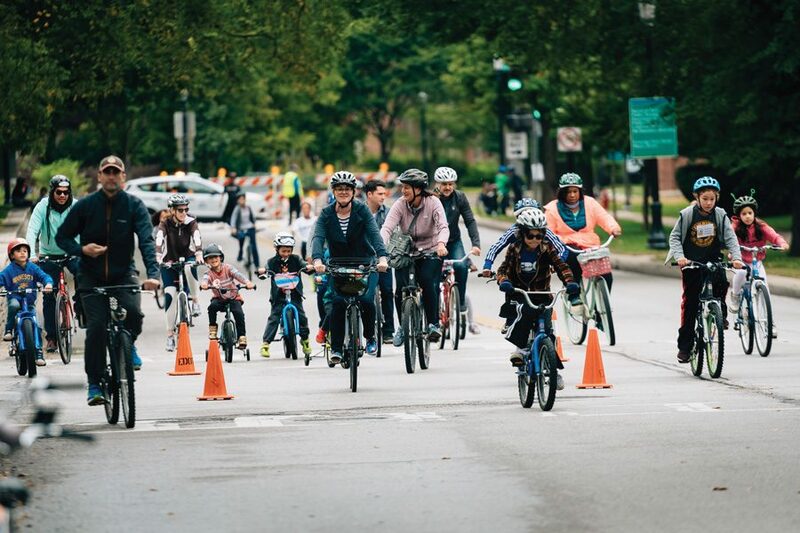 The city closed Ridge Avenue to vehicular traffic to create a safe environment for family cycling, with entertainment events such as live music and food trucks. When Seth Green’s daughter Sojourner — Sojo for short — was nine months old, he and his wife, Caitlin Fitz, were heading to Bagel Art for breakfast on a Sunday morning. On the way, they stumbled upon a bicycling event and decided to join in. Seven years later, Sojo Fitz-Green is now seven and a half years old and has been a Bike the Ridge participant for her whole life. She and her little sister, Lundy Fitz-Green, 4, enjoyed a bean and cheese taco from Amanecer Taco Shop in Ridgeville Park after biking up and down Ridge Avenue. Mayor Steve Hagerty kicked off Bike the Ridge at 9 a.m., clad in a navy Syracuse windbreaker and a silver bike helmet. Until 1 p.m., the city closed Ridge Avenue to vehicular traffic from Church Street to Howard Street, allowing cyclists to ride freely throughout the streets. Though cycling was the main focus of the event, food trucks, sponsors, bounce houses and live music filled Ridgeville Park and Alexander Park to provide additional entertainment for riders. Ald. Ann Rainey (8th) started the event in 2008 with Anjana Hansen, former 9th Ward alderman and current judge for the Circuit Court of Cook County. Ridge Avenue had been under construction for a year once Evanston assumed control of the street from the state of Illinois, and upon opening it, Rainey said the idea arose to have a day to celebrate bicycling on a road where bikes were typically prohibited. Beyond riding up and down Ridge Avenue, the event offered bike repairs, registration and decorations, as well as providing free helmets to riders while supplies lasted. As participants over the years have tried to expand the event to include other forms of transportation, such as scooters and strollers, city manager Wally Bobkiewicz said the focus has remained on allowing biking in the street. Due to the narrowness of Ridge Avenue, a bike lane cannot fit on the road. Widening the road would require removing the tree canopy lining the street, Bobkiewicz said, so for now, bicyclists will only be able to ride on Ridge Avenue for one Sunday of the year. For the Fitz-Green family, attending Bike the Ridge is a tradition, Seth Green said. “It’s definitely our favorite Evanston event,” he said.